The main event of UFC on Fox 24 pits Wilson Reis against the “God of Fighting” Demetrious Johnson. It’s a match up that Reis fought hard to earn, but that makes it no less easier by any stretch of the imagination. Demetrious Johnson is tough. Not just the “he takes a good shot” kind of tough, but made of different stuff as far as competition goes. Johnson hopes to crush his opponents by taking their strengths and making them null and void. So while Wilson Reis has certainly earned his spot opposite the champion, he has an uphill battle ahead of him. As far as performances go, Wilson Reis hasn’t looked like the ultimate world beater. He has good fundamentals as far as his striking goes, but where he really shines is the wrestling and Brazilian jiu-jitsu department. Reis is a ground fighter through and through who uses a variety of different takedowns to get the job done. That said, if he hopes to pick up a victory here then he can’t rely solely on his grappling. In fact, as dangerous as it may sound, Reis should perhaps take a strike first, wrestle second approach to this fight. Johnson is expecting the takedown in this fight, so using an alternative game plan will be key. But it’s not simply the execution of the strategy that should be considered. Reis’ mindset should be focused on fighting anywhere the fight takes him. If he relies too much on his wrestling and grappling, Johnson will chew him up. Playing the outside game with long range weapons is an ideal strategy to force Johnson to push forward. It’s during these moments that Reis can take advantage and score a reactive takedown. Firing off jabs and front kicks will keep Johnson at bay and when the champ does choose to rattle off combinations, that’s when Reis should look to level change. The gas tank of Reis will be tested in this one, so he’ll have to be smart with his energy systems. The champion has a far more interesting case on his hands. For Demetrious Johnson, having a multitude of skills to choose from makes his strategy as complex as it is simple. Johnson has so many tools to choose from it’s a matter of being patient and seeing what threat Reis presents. Johnson can choose to be aggressive counter puncher if Reis is passive, hit reactive takedowns if his opponent is overly aggressive. He can box if Reis is looking to shoot in, kickbox if the challenger chooses to box. For Johnson the sky’s the limit. Preferably the aggressive counter striking approach will likely work best. Touching Reis with jabs, forcing the challenger to shoot in, stuffing the takedown and countering immediately with power punches. As most other ‘Mighty Mouse’ fights, this is Johnson’s match to lose. It’s a up hill battle for Wilson Reis. Can he get the job done against Demetrious Johnson? The post UFC on Fox 24: Wilson Reis Is In For The Fight Of HIs Life Against Demetrious Johnson appeared first on Cagepotato. They were directed at Anderson Silva, right after Silva took apart Chris Leben in 49 seconds. Silva’s debut was an eye-opener. Heading in people were half-enamored with Leben’s it’s-2am-outside-the-bar fighting style and attitude, particularly Leben himself. He wanted to showcase on the Brazilian, who was coming over from Japan with plenty of happy superlatives. Yet shortly after Goldberg said, “wow, Silva’s one intense dude,” Silva just kind of let the general “wow” hang in the air for the next minute. He styled on Leben’s face with a sniper’s jab, a head kick, and finally, from a vicious plum, a knee that he drove right through Leben’s brow. He cut angles with the same sharp precision as he landed his shots. That night, June 28, 2006, was the beginning of a 16-fight run that earned “The Spider” the only four-letters worth fighting for: GOAT. People forget Silva was already 31 years old when he fought Leben. That was ten-and-a-half years ago. This weekend, when he takes on Derek Brunson at UFC 208, he’s trying to rediscover some of that magic, even if the fight game has shown us so many times that the rabbit isn’t like to return to the black hat once out. Silva’s now 41 years old. He’ll be 42 in April. He is seemingly a million miles from a title shot. He hasn’t won (officially) in four years. He has watched his leg snap in half, and his swagger dissipate in an instant while trying to psyche out a psych major from Hofstra. Still, there’s a mystical feeling to Silva, who from 2006-2013 dominated a sport where there are so few real masters. There’s still a feeling of a detour in play, that we’ve been just navigating around a construction zone trying to get back to that main road, which is smooth and heading in the familiar direction. This week he’s been dressed in black. At the media day in Brooklyn on Wednesday, there was a joke that he was dressed as a “hacker,” with his dark jacket tails and long sleeves. At old Gleason’s Gym on Thursday, right in the shadows of the Brooklyn Bridge, he looked more like a superhero dressed in skintight dry-fit. The old boxers in the gym stopped and watched Silva shadow box and jump rope. He wasn’t a boxer or a mixed martial artist, but one of fighting’s great auras. “Who is that?” one of them asked. “That’s Anderson Silva,” another one said. Was is a word that stings a fighter who still believes he can do it. Silva still believes he can do it. At least, he says he does. 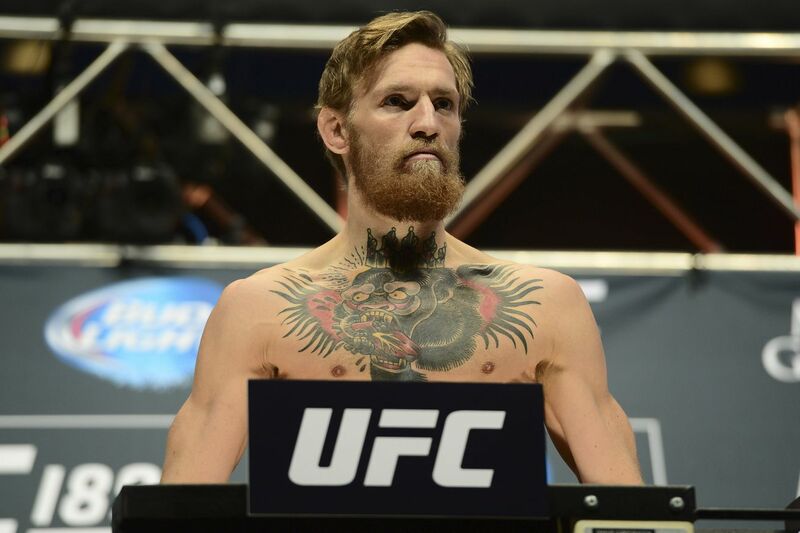 He’s halfway through a 10-fight contract with the UFC, and he says he intends to fulfill it. But that’s not all. There are other words…Title…Champion…King. Silva has more than a knapsack of old memories, he has intentions. He says he wants to work his way back to the top, a top that became less far-fetched when Michael Bisping beat Luke Rockhold last summer. Maybe it’s not intentions but delusions. Brunson is a feast or famine fighter. The crowd gathered on a snowy Thursday cherished its glimpse at Silva, who played it up. Brunson was no-nonsense. He went through his mitt session like someone who is. Whatever happens at the Barclay’s on Saturday night, there’s a great career winding down in the young sport of MMA. With the galvanizing forces of Ronda Rousey and Conor McGregor breaking through in ways that the old guard never could in the last few years, Silva has remained a kind of bigger than life presence. People haven’t — and soon will — forget those performances. As he worked out at Gleason’s, everybody was seeing the same thing. It was how he took out Rich Franklin at UFC 64 to win the belt, using a missiles-to clinch game that truly hadn’t been seen to such devastating effect in the Octagon. It was how he responded to losing the first round against Dan Henderson in Columbus…and the night he personally went head-to-head with James Irvin and Affliction, punching a hole in one and helping to bring down the other…it was the time he went berserker in Abu Dhabi against Demian Maia, and Dana White threatened to cut him…it was the Chael Sonnen series, which at the time turned into the biggest rivalry in fighting. You could still see the Phantom of the Opera mask, still see the Michael Jackson impersonations, the Big Macs. Silva had the movement to bewitch Forrest Griffin in Philadelphia, and bring the UFC back to Brazil after a decade away against Yushin Okami. Goddamn Anderson Silva, who front-kicked Vitor Belfort’s head in a way that still seems impossible. One of the onlookers at Gleason’s said, “fighting’s weird man, one day you wake up old.” Silva was on top of the MMA world for many years, and then one day he wasn’t. He couldn’t solve Chris Weidman. He beat Nick Diaz, and then he didn’t. He had Bisping out, and Bisping still won. He volunteered against Daniel Cormier on two day’s notice, and Cormier wisely opted not to strike with him. Why would you? The man is a different kind of striker. Or at least he was. Welcome to Midnight Mania! It’s a little like The Zone … things are just off somehow, and you can’t figure out exactly why (it’s probably because you should be asleep). Today, we will take a look over the amazing violence that was UFC 206, take a look at the memes and .GIFs you all love, and appreciate my man, Jerome-Max Holloway. I am starting to think Holloway is the budget Conor McGregor. Lasting three rounds with the Lightweight kingpin back in 2013 must have imbued some dormant chakra that is just now being activated, because UFC 206 — where the Hawaiian stopped Anthony Pettis to claim the interim 145-pound title (watch highlights) — was in broad strokes not dissimilar to McGregor’s arrival party, UFC 189. An event that, because of last-minute injury to one of the main event contestants, featured a questionable interim Featherweight title? Perhaps the pay-per-view (PPV) main card of the year, featuring both what many are calling the “Fight of the Year and “Knockout of the Year”? A Scandinavian Welterweight taking a clean win over a young striker? A 170-pound co-main that was a masterclass of both technique and heart, with an uber-violent finish in the last round? A backup Featherweight fight that more than delivered on it’s promise of action, with the veteran underdog coming up victorious? A young prospect knocking out an aging veteran after a back-and-forth contest? And then there is the headliner, a young talent on a tremendous run, capping off his tremendous run with a beautiful technical knockout finish to win (interim) gold. There are differences, of course. This is Holloways’s tenth consecutive victory and fifth win in a row over a Top 10-ranked opponent. McGregor, thanks to his mouth, needed only one of those (Chad Mendes) to earn himself a title shot (Dennis Siver was just busywork). Sure, Holloway lacks the raw power of McGregor, but he is more varied in his techniques and has been equally effective in negating Featherweight foes. He is only 25 years old, elevating his trash-talk game to genuinely entertaining levels. I can also get behind him calling Jose Aldo “Waldo” because it’s true. Aldo’s frequent injuries marred an otherwise stellar reign even before McGregor. Holloway also isn’t making the mistake of seeming desperate for that McGregor fight. McGregor has famously repeated the adage that winners focus on winning, losers focus on winners. What is especially impressive is that Holloway is gaining traction simply by being himself. His ability is unquestioned, and now he faces off with Aldo, ostensibly as soon as UFC 208. This was absolutely incredible, and yes, quite possibly the “Fight of the Year,” up there with Lawler-Condit and Diaz-McGregor 2. Certainly, the second round was the round of the year for me. I’ve always been a huge fan of Swanson, who doesn’t know how to fight boring. And Doo Ho Choi is on some other ish. Here are the regular highlights of that one, mostly showing Swanson’s work. Kelvin Gastelum vs. Tim Kennedy was a fun one, too, except for maybe Kennedy, who got torched for as long as the Middleweight match remained upright. I posted this yesterday, but since no one reads the weekend Midnight Mania, I’m going to refresh you on a little something called angry Greg Jackson that happened during the Swanson vs. Choi fight. This was thoroughly hilarious to me, partly because Jackson anticipates Swanson getting rocked like a prophetic savant, partly because it’s incredibly relatable and partly because its so Greg Jackson. The guy is weird, but he’s close to the ideal cornerman, and his advice has included faking Russian accents for his Dagestani fighters, telling fighters (Cub Swanson, in fact, if memory serves me correctly) to “find your waterfall” and shouting “Yeehaw!” at Cowboy Cerrone. In other news, former Middleweight champion Luke Rockhold called out former Light Heavyweight champion Jon Jones. And I am all about this. I don’t want Rockhold injuring himself, but honestly, I would watch the heck out of that. Jones submitting Dan Henderson last night at “Submission Underground 2” (results here) was as predictable as anything can be, but Jones against the best grappler/defensive wrestler at Middleweight? Yeah, I would watch that all day long. I wouldn’t care at all about this. We’ve already seen the Jones and Chael grappling match in the cage … and it sucked (for Chael). Urijah Faber is fighting his last fight this Saturday night (Dec. 17, 2016) at UFC on FOX 22. He was on “The MMA Hour” today and, well, sometimes Faber speaks and I’m not entirely sure what’s coming out of his mouth. Karim Zidan does actual journalism in mixed martial arts (MMA), and somewhere between the .GIFs and sweet clips that should be appreciated. Here he asks why the Ontario commission sponsored UFC 206 to the tune of $ 150,000. Oh, and Khabib Nurmagomedov has a huge following in central Asia … one that he claims is bigger than McGregor’s. Paige VanZant. Never heard the name? She’s not been noticed much, not given many opportunities by UFC or the media, and her talent has gone largely unnoticed, but at least she is a fascinating and interesting person. If only she were blond and photogenic. Oh, wait. I always thought she looked a little like Khaleesi, the Mother of Dragons. I am so the mother of dragons!!! Lol just watched Game of Thrones for the first time. Anyway, she’s fighting this weekend against Michele Waterson in the UFC on FOX 22 main event. I have no idea why the UFC markets her so heavily. None. Zip. Zero. Another entry for my poster contest for my fight! Comment and like if you want this to be the winner!! es normal. . . .
Maybe part of the reason UFC is looking at a “dream” commentary team. McGregor continues to crop up even though he’s not fighting. This SNL skit parodies him. I don’t know how well, but it parodies him. Listen to the Co-Main Event podcast for the week. T-Ferg has some things to say, as well as reveals that he is down for a season of The Ultimate Fighter (TUF) featuring himself and Nurmagomedov. T.J. Dillashaw tells about the “last straw” that caused him to join up with the MMAAA. The problem with this is (Cowboy is a great example) getting fighters of totally different situations to all speak together is intrinsically so difficult. What’s next for Anthony Pettis? Losing four of five puts the Wheaties box veteran in a tough and weird place. Mickey Gall claims to have some insight on Sage Northcutt’s training and work ethic. Winning a UFC belt brings a lot of benefits to your career and personal life, but can also attract new “friends” that aren’t really there for you. Rafael dos Anjos lost the UFC lightweight championship to Eddie Alvarez in July, and felt that some of the people around him didn’t really care that much about him. Dos Anjos was riding a five-fight winning streak coming into his title defense against Alvarez at UFC Fight Night 90 in Las Vegas, and suffering his first defeat since winning the belt in March of 2015 changed the way he saw some of those people. “I learned a lot of things, man,” dos Anjos told Ariel Helwani on The MMA Hour. “For an example, how people treat you, you know? It was a big lesson for us, especially the way (the fight) went. People treat you one way when you’re champion, but when you’re not the champion everything changes. People treat you different. And that was not the only change dos Anjos made in his life after losing the belt. The Brazilian lightweight, who hasn’t even watched his loss to Alvarez (“Only highlights,” he explained), stopped worrying about social media. Dos Anjos hoped for an immediate rematch with Alvarez after going on a 10-1 run between 2012 and 2015, but the promotion opted to give match him up against rising lightweight Tony Ferguson in Mexico City on Nov. 5. And despite losing his belt to Alvarez via first-round knockout, dos Anjos still believes he’s the best lightweight in the UFC. Dos Anjos vows to “push the pace” and end Ferguson’s eight-fight winning streak at UFC Fight Night 98. He hoeps that’s enough to put him back into title contention. TORRANCE, Calif. – Brian Ortega talks fighting and defeating Clay Guida at UFC 199, the death of Muhammad Ali, his crazy year and much more. LOS ANGELES — Does bachelorhood or family life make for a better fighter? That question has become the unlikely faultline which has turned the buildup to the UFC 199 rematch between UFC middleweight champion Luke Rockhold and former titleholder Chris Weidman substantially more tense and pointed than the leadup to their first meeting at UFC 194. A Wednesday media tour of Los Angeles promoting their June 4 rematch in nearby Inglewood flared up early, when the duo touched upon family life during an appearance on ESPN’s SportsCenter, then continued during a media day at the JW Marriott next to Staples Center. At the heart of the matter is Rockhold, a noted bachelor, claiming the married Weidman’s family life serves as a distraction. For his part, Rockhold, who defeated Weidman via fourth-round TKO to win the title at UFC 194, says he only talks about it because Weidman brought it up first. Weidman counters that the single life carries a whole lot more potential for distraction than someone who’s settled down. Appraised of Weidman’s comments, Rockhold, with the last word for now, countered that single life is something you can shut off, while you can’t neglect a family. Despite his best attempts to do so, Conor Mcgregor didn’t get under Rafael dos Anjos’ skin during their recent UFC 196 pre-fight press conference in Las Vegas, Nevada. Not even interrupting dos Anjos repeatedly and talking about his family could prompt a rebuttal from the Ultimate Fighting Championship (UFC) Lightweight champion. “RDA” did admit, though, that the trash-talking Irishman is definitely in his head. 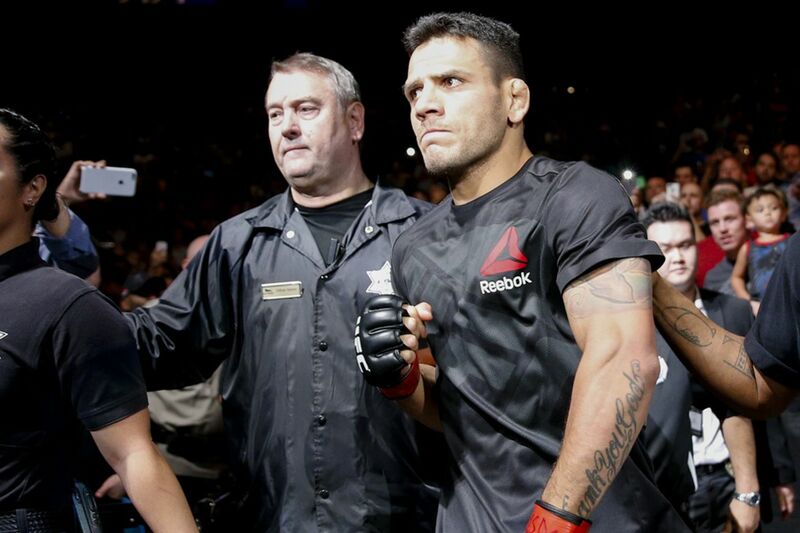 During a recent stop at “The MMA Hour,” dos Anjos explained that he keeps his cool and doesn’t argue with crazy people. But, come fight night, he intends to let out all his rage and beat McGregor to the point that he’ll have nightmares about his decision to move up to 155 pounds. Eddie Alvarez previously chimed in on the match up, saying that a “simple” way of defeating McGregor was simply taking him down and pounding him out instead of striking with him. dos Anjos, however, respectfully disagrees, claiming he can take out the Irishman in any aspect of the fight game. Conor McGregor has never been one to shy away from the limelight.